In 2015, Greater Texas Foundation approved a grant in the amount of $847,100 to support the Lee College Dual Credit Institute, which will allow rural high school students to access and complete a postsecondary credential prior to high school graduation. In making funding decisions, GTF considers long-term outcomes beyond the grant period. Although still early in implementation, the foundation is excited about early outcomes of this innovative program and the promise for the Institute to help keep students on track for a postsecondary credential. This grant supports guided pathways for students and also aligns with the foundation’s strategic focus on supporting students in rural areas of the state. Read more about the Institute in this update provided by Dr. Christy Ponce, Vice President of Student Success, Workforce and Resource Development at Lee College in Baytown, Texas. In the Spring of 2016, Lee College was fortunate to open the new Lee College Education Center in South Liberty County thanks to the support and collaboration of many community partners including the generosity of the Greater Texas Foundation. The Center was established in a central rural community to create a college going culture and workforce pathways opportunities for students and entire families from primarily five communities throughout the region. Lee College worked in partnership with multiple area school districts to create a new and innovative Dual Credit Institute where students can become college ready, maximize the amount of dual credit earned while in high school, and earn a college credential in technical or academic fields while still enrolled in high school. The five school district partners were eager to provide new opportunities for their students and offered to provide a facility in a convenient location where Lee College could provide centralized course offerings and programs of study to all surrounding communities. Lee College offered curriculum, new program design, innovative faculty, and made a commitment to provide access and affordability by establishing a low $100 per course flat rate tuition for dual credit courses—as well as tuition and textbook scholarships from the Lee College Foundation for students needing financial assistance. The mayors from each participating city advocated for the support needed to provide this new opportunity for students and made sure community members were involved and informed. 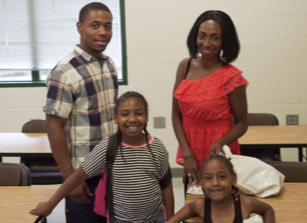 The Liberty Community Development Corporation and the Dayton Community Development Corporation offered financial support to help purchase furniture, technology, and equipment for the new Education Center. All of this would not have been possible without the generosity from Greater Texas Foundation who provided the seed funding to help make this dream a reality for the communities in this area. The Greater Texas Foundation grant allowed us to purchase state of the art technical equipment essential for the high demand programs such as process technology, electrical technology, EMT and Computer Aided Drafting and Design. The community is eager to have bridges to brighter futures with workforce training and degree programs to help students take advantage of the careers available in the vibrant job market in the region. 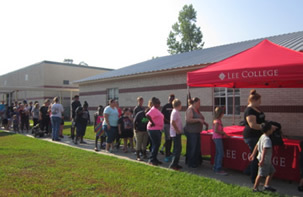 Members of the community lined up eager to find out more about the Lee College programs and resources at the college’s “Back to School Bash.” Hundreds more celebrated with us at the Center’s Ribbon Cutting and at the Community Open House. 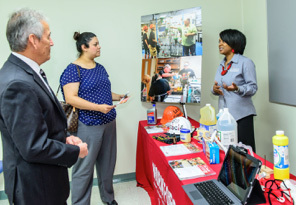 The Lee College Education Center also benefits business and industry by providing training to a viable workforce in high demand, high wage careers available in this region, and providing customized and fast track career training available for students in search for immediate employment. In addition to the premiere Dual Credit Institute, the Lee College Education Center is designed to create a college going culture by offering courses the whole family can take advantage of with intentional family friendly scheduling including programs like a Kids College, Academic Transfer, Technical Programs, and Senior Adult Courses. High school students participating in the Dual Credit Institute are bussed by surrounding high schools to the Lee College Education Center. Students are able to take advantage of a full set of college courses available to them during the regular high school day leading to a college credential. 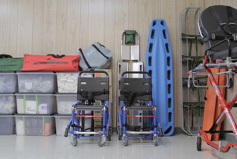 The Lee College Education Center offers an Emergency Medical Technician (EMT) training program to meet the needs of a growing health career industry and shortage of health care workers. The Lee College Education Center plans to expand every semester offering daytime, evening, and weekend courses in the future to provide a variety of convenient scheduling for students. Lee College is taking services directly to students and increasing access and completion to postsecondary education across the Lee College service area with the new programming by offering stackable credentials, cohort enrollment, block scheduling to maximize academic transfer courses, and clearing pathways into the workforce. After only one semester of full operation, four students – Jason Taylor Pridgeon, Madeline Alexandria Holdsworth, Azjah Sierra Green, and Job Micah Dyson – have already accelerated their college pathway journey and completed a workforce certificate. Many more students are set to complete additional stackable credentials towards an associate’s degree in the upcoming semesters. 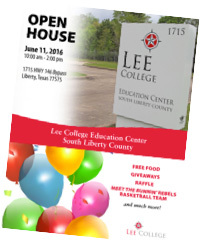 At Lee College, we are excited about what this Center will mean to the region. High school students have already started to take advantage of the “new insight” college and career programming offered during the summer in collaboration with Project Grad where students participated in experiential learning about technical programs. Students heard from industry partners about “a day in the life” of careers available in their area while also taking college and industry tours and participating in academic preparation. Students from these rural communities also visited Houston Fine Arts Museum for the first ti me in their College Art Courses and received enriching experiences. They were able to see what they learned in the classroom come to life. 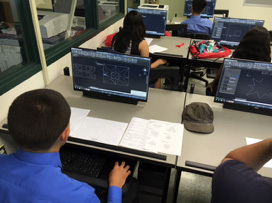 Middle school students began taking courses in a summer CADD Camp. Students have shared feedback about their great experience, describing learning computer program commands on the first day, layers and viewports by day two and isometrics by day three providing them with the skills to draw an iPod and even design their future homes. They ended the week with printing their designs on the 3D printer and plotter. We are working hard to provide enriching experiences such as these in a variety of fields helping students inform their decision on future college and career choice. Dr. Dennis Brown, President of Lee College, has high hopes for the Lee College Center in South Liberty County and envisions that it could grow into a full comprehensive college campus and the hub of higher education where students can complete the academic, technical, adult basic education, GED, community education, nationally recognized workforce certifications, and workforce training needed to improve their lives. All of these programs complement the Dual Credit Institute. The Center will continue to grow as student enrollment builds and new degree pathways are offered. Below are the stories of three students whose lives have already been changed as a result of the program. My perseverance to excel and go beyond expectations is what separates me from most individuals. I come from a background that is fairly commonplace in this country; immigrant parents leave the only life they’ve known to follow the American dream. My parents’ resiliency to provide, face a language barrier, and assimilate to a new way of life reinforced strong character in my siblings and I. Growing up, we didn’t have much, but we weren’t poor either. My father always ensured all eight of us had what we needed while my mother ensured our home was a happy one. I strive to live the American dream they envisioned for my siblings and I and to not become an unfavorable statistic. While the struggles of my parents were a calculated risk, my struggles as a teenager were self-inflicted and based on poor judgment. My future was bleak and uncertain after my pregnancy as a youth, but it’s the life changing event that would steer me to the course that I now follow. My mistakes in life don’t define me but my perseverance to provide a better quality of life for my child does. My son and I study together and while to him this may be normal, I know things should be different. I know I have to advance in life so I can lay the road for him to follow and later he can exceed. With this education, I will break barriers my family has yet to conquer and set a new precedence for education with my child. As my parents were my heroes growing up, I hope my child can one day view me as his hero. Everything I do is for them and I will not let them down. Imagine living in a small town occupied with only gas stations and fast food joints. Unfortunately, this is the card I am given. I was born in a small town but my ambitions are far too big for this place. I have had my share of struggle and at such a young age, now that I am 21 years old, I must do this for myself. I have always been the independent one in my family; however, I am also the baby of the family. So my motivation is not only for myself, but for my parents as well. I want to be able to give back to my family and make them proud. They want me to go farther than they did. Having this education, would change my entire world. “Life is live and learn” my dad always told me. I am so lucky to have the support of so many people who believe in me and want to see me graduate and make something of myself. As of now, I am stuck in a vicious cycle of struggle. I have a small home that I am living in that is also unfinished. Yes I am living in it, and it is so hard. I wake up every day to a scorching hot house, or trembling to the cold that seeps through the un-insulated walls and floors. The money is slow coming and the times are hard. The bills take most of my “part-time” check and what is left is just enough for necessities. My life has been like this far too long. “Be the best you can be,” mom said, and it echoes through my head. I deserve better than this, it is time to step up. I get only one life, one chance, it is time to seize the day. Its time to live my life and to get an education, to make myself better than I am now. Tomorrow will be a better, brighter day. The whole reason why I am attending school is to make a better future for me and my kids. When I look at them I just want them to be proud of me and know that their dad is and will be able to support them financially and emotionally. They are my world, and I just want them to have the resources in life that I didn’t have. I know by me going to school and furthering my education I can open doors that can lead to a greater life for me and my family. I’m not just signing up for school just to pass and get the degree, I really want to take full advantage of my resources that Lee is offering.